Many folks have reported that walking into Kate's Teahouse is like taking a deep breath in an aromatherapy manufacturing center. There are so many aromas and essences swirling around, You will feel both relaxed and invigorated at the same time. Tea and history go together like, well, tea leaves and hot water. The 1850's mining town, Columbia, is literally steeped with essences of treasure, adventure and stories. 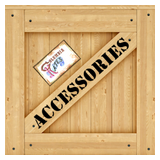 Columbia Kate's spin on the age-old drink tells its own story while offering antiques, specialized gifts and even antique buttons which are notorious story tellers themselves. Seated at tables named after real mining claims of Columbia's heyday, a guest may learn why women of early California had entrepreneurial opportunities like no other state at that time. Over a cup of tea, stories fly through the air like dimes from the old barn's reputed ghost of a murdered French woman. She is said to have worked in a bakery on the same site before there was a barn. Why she likes dimes, no one knows. 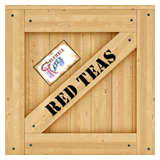 Recalling roots earlier than even British tea, Kate's shares tea lore as liberally as the gold miners squandered their gold on water, wagering, whiskey and women. 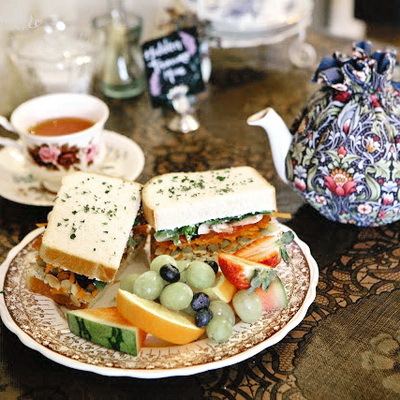 Set in an 1880's period barn in historic Columbia, CA, our focus is in providing both an education in the Art of Afternoon Tea and enhancing a visitor's experience of Columbia while offering a pleasant atmosphere and a modicum of culture to a gold mining town. Beautiful Columbia, with Main Street looking north from the Wells Fargo Building. Columbia Kate's is just up the street and right on State Street, one block over to Columbia Street. On the site of an 1850's French Bakery in the restored gold rush town of Columbia, California sits a red barn built by town icon Frank Dondero in the 1890's. Over the hundred or so years since, the red barn has been many things to many people. To one Kathryn (Katy) McMahon, the Sierra Gold Tea Company was a place of warmth and comfort where she made memories with her young son in the very early part of this century. When the sisters who owned the teahouse let Katy know they were retiring and closing the teahouse she did the only thing she could do, she bought it from them that day. Sierra Gold Tea Company closed in October of 2003. From that day forward Katy shared her dream of the Teahouse continuing in Columbia with her friend, Clare Bazley of Southern California. 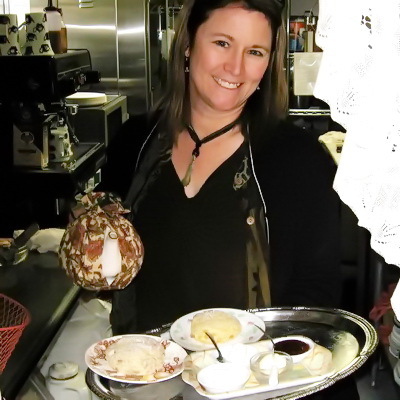 A few short years later, on February 1, 2007, Clare Bazley opened Columbia Kate's Teahouse and in honor of Katy's guiding influence, named it after her. Katy loved the apricot scones served at Sierra Gold, but was always disappointed when they were sold out of them. Apricot scones are still the most popular scones we bake and we try very hard to never run out. 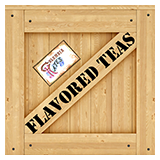 Under Clare's ownership, the Teahouse has become what Katy imagined; a warm, hospitable respite offering the finest foods and teas. Sadly, we lost Katy to brain cancer in 2008 but her legacy lives on as the standards she set guide us to this day. On the sixth anniversary of the Teahouse, Columbia Kate's opened the Bakery and Boutique across the street from the red barn. Katy would approve. Or to try some of our wonderful Teas at home, click the "Tea Shop" above and start shopping. 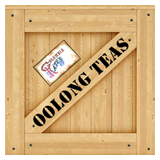 over 300 Teahouses in California. Check us out and write a review! liveliest tea communities on the Web. You can even read and post reviews. 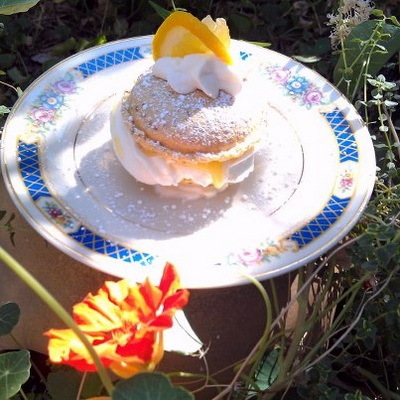 If you think tea and fine food goes well with an interest in buttons then you'll not only doubly enjoy your visit to the Tea House, you'll also enjoy a visit to my vintage button collecting website Abuttonlady. Also, when planning your trip, be sure and visit the Columbia California events page for things to do while in Historic Columbia.